The premise: Eighteen-year-old auto mechanic Sawyer Taft did not expect her estranged grandmother to show up at her apartment door and offer her a six-figure contract to participate in debutante season. And she definitely never imagined she would accept. But when she realizes that immersing herself in her grandmother’s “society” might mean discovering the answer to the biggest mystery of her life-her father’s identity-she signs on the dotted line and braces herself for a year of makeovers, big dresses, bigger egos, and a whole lot of bless your heart. The one thing she doesn’t expect to find is friendship, but as she’s drawn into a group of debutantes with scandalous, dangerous secrets of their own, Sawyer quickly discovers that her family isn’t the only mainstay of high society with skeletons in their closet. There are people in her grandmother’s glittering world who are not what they appear, and no one wants Sawyer poking her nose into the past. As she navigates the twisted relationships between her new friends and their powerful parents, Sawyer’s search for the truth about her own origins is just the beginning. This is not the kind of book I normally read, as a friend bought it for me, but this meant the book was refreshingly unique, both in premise and in execution. 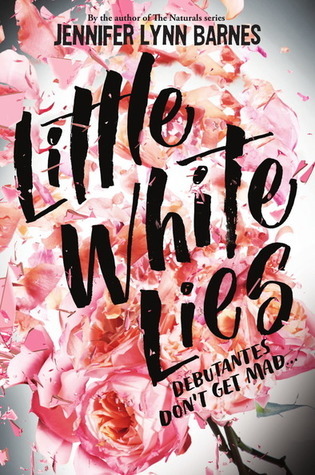 I liked that Little White Lies was funny and well written. The characters, especially Sawyer are complex and grew throughout the book. There were many plot points that were unpredictable but plausible, leaving the reader both surprised but satisfied. Just as a mystery should be. Unlike most mysteries, however, there weren’t logic-defying trails of dead bodies following a somehow-immune-to-murder protagonist. Just some good old-fashioned southern charm, little white lies, and a whole lot of secrets. The tension continued throughout the book, which was great as a reader, but some of the stakes seemed arbitrary and/or unimportant so I had trouble feeling the way the characters did about certain threats (ie tense or scared). Some of this could have come from the fact that there were a lot of secondary/tertiary characters that I had trouble keeping track of and thus forgot how they contributed to the plot. With a few less characters, I would have loved this book even more. I also would have liked Sawyer to do more to make the conclusion occur rather than watching a most of it fall into place. She finds out information at the end that didn’t seem to have a reason to not come out earlier and she is, in my opinion, swept along rather than integral in orchestrating the final events. I do have to say, though, that this was an entertaining novel. I haven’t read a book quite like this and appreciated the author’s style and voice. There were hints of romance but they weren’t over-the-top or cliche, something I also appreciated. Sawyer herself was witty and smart, versed in a wonderful variety of niche areas like lock picking and medieval torture, and stayed true to who she was despite being surrounded by debutantes and similarly behaved family members. Despite the common jump from debutante-like characters to themes about superficiality and such, Barnes did a great job exploring more unique, complex, and frankly interesting ideas within this world. For example, instead of just “perfect girl is not as perfect as she seems” or the like, even motives can be deceiving– for family, friends, and frenemies. All in all, if you are looking for a YA book that is funny and unique, read this one. Also, if you are looking for a mystery, a book about debutantes, information about medieval torture devices, unexpected plot twists, societal drama, and a no-nonsense Grandma, read this book.